I created this map with all the locations of known species of peacock jumping spider. I’m planning on using it to help organise a holiday (which could evolve into an expedition) to see as many of the known species as possible and to perhaps find a new species. Maybe, someone with the same obscure interest will find this map interesting/helpful. All images are from Jurgen Otto’s flickr and all the locations have been dredged from the references below. When you click on a waypoint, the number next to the species name refers to the picture number in the description. There are currently 48 described species of Peacock jumping spider and a further 16 are currently undescribed. This map features 37 species (plus a few other Salticids). Otto, J. C. and D. E. Hill. 2016. Seven new peacock spiders from Western Australia and South Australia (Araneae: Salticidae: Euophryini: Maratus). Peckhamia 141.1: 1-101. Otto, J. C. and D. E. Hill. 2016. Maratus fimbriatus, a new peacock spider from the Darling Riverine Plains of New South Wales, with a review of the Maratus chrysomelasgroup (Araneae: Salticidae: Euophryini). Peckhamia 136.1: 1-24. Otto, J. C. and D. E. Hill. 2015. Maratus elephans, a new member of the volans group from New South Wales (Araneae: Salticidae: Euophryinae). Peckhamia 123.1: 1-19. Otto, J. C. and D. E. Hill. 2015. Adult display by a penultimate male Coastal Peacock Spider (Araneae: Salticidae: Euophryinae: Maratus speciosus). Peckhamia 122.1: 1-6. Otto, J. C. and D. E. Hill. 2015. Two new peacock spiders of the calcitrans group from southern Queensland (Araneae: Salticidae: Euophryinae: Maratus). Peckhamia 121.1: 1-34. Otto, J. C. and D. E. Hill. 2014. Peacock spiders of the pavonis group from southern Australia (Araneae: Salticidae: Euophryinae: Maratus). Peckhamia 117.1: 1-62. Otto, J. C. and D. E. Hill. 2014. Description of a new peacock spider from the Gnangara Mound north of Perth, Western Australia (Araneae: Salticidae: Euophryinae: Maratus). Peckhamia 115.1: 1-8. Otto, J. C. and D. E. Hill. 2014. Spiders of the mungaich group from Western Australia (Araneae: Salticidae: Euophryinae: Maratus), with one new species from Cape Arid. Peckhamia 112.1: 1-35. Otto, J. C. and D. E. Hill. 2013. Three new Australian peacock spiders (Araneae: Salticidae: Maratus). Peckhamia 108.1: 1-39. Otto, J. C. and D. E. Hill. 2012. Notes on Maratus Karsch 1878 and related jumping spiders from Australia, with five new species (Araneae: Salticidae: Euophryinae), version 2. Peckhamia 103.2: 1-82. Otto, J. C. and D. E. Hill. 2012. Two new Australian peacock spiders that display inflated and extended spinnerets (Araneae: Salticidae: Euophryinae: Maratus Karsch 1878). Peckhamia 104.1: 1-28. Otto, J. C. and D. E. Hill. 2011. 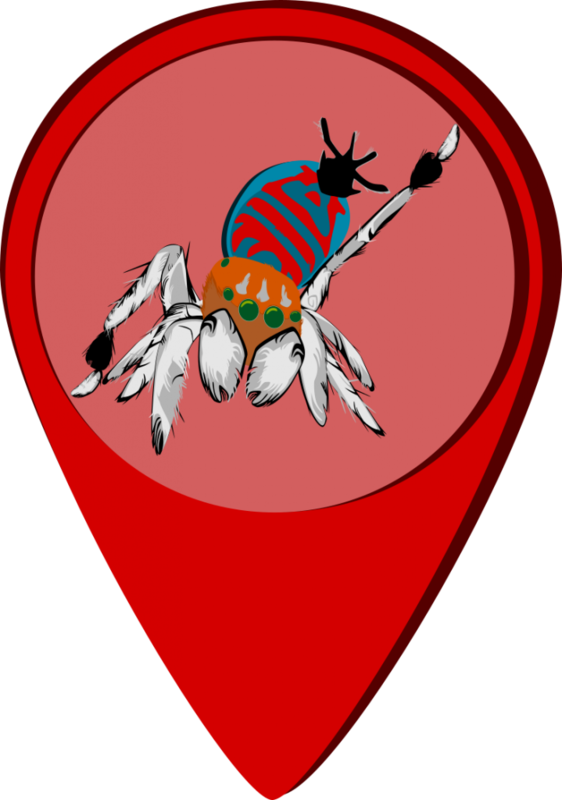 An illustrated review of the known peacock spiders of the genus Maratus from Australia, with description of a new species (Araneae: Salticidae: Euophryinae). Peckhamia 96.1: 1-27.